Eriosyce (Cactac.) gen. revis. & ampl. (Succ. Pl. Res., 1) 117 (1994):. Origin and Habitat: Eriosyce bulbocalyx species is endemic to Argentina (La Rioja, San Juan, San Luis). Altitude: It grows at elevations of 500 to 1500(-2400) metres above sea level. Habitat and Ecology: The species grows in monte shrubland and chaco forest, in rocky shallow soils along with Setiechinopsis mirabilis. There are no known major threats for the species, it has a wide range, is relatively abundant, and occurs in protected areas. 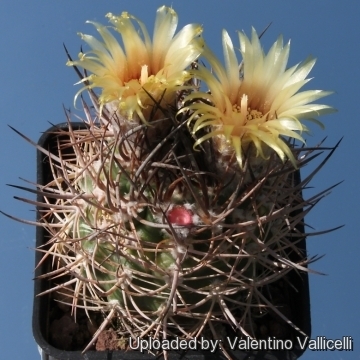 Pyrrhocactus umadeave var. marayesensis Backeb. 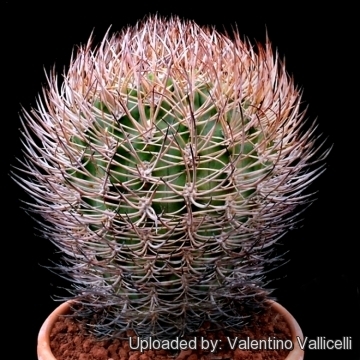 Description: Eriosyce bulbocalyx is a solitary globular cactus with unique and remarkably beautiful shape. 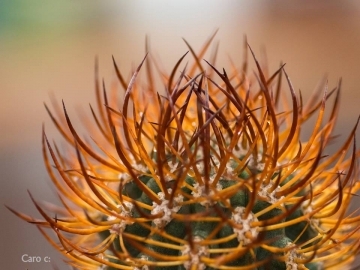 The apex is characteristically covered with very thick, incurved, rust-coloured spines. Stem: Globose to sub-globose or short-cylindrical as it becomes old, grey green, up to 12 cm in diameter, eventually up to 50 cm tall. Ribs: 12-13(-17), swollen beneath the areoles. Areoles: Conspicuous, oval, woolly and hairy when young (with yellowish felt), later naked. 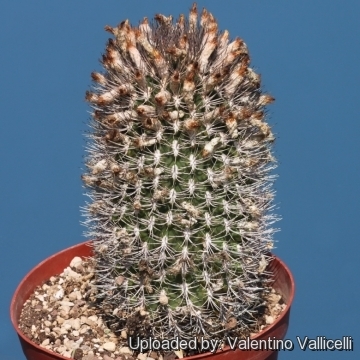 Central spines: 1-4, subulate, nearly 2,5 cm long, stout, typically rusty red or horn coloured, but ranging from pale-yellow to dark-brown, becoming grey as the age, sometime with black tips, all curved upwards, base swollen. 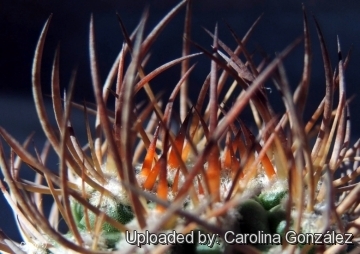 Radial spines: 7 to 12 about 1,5-2 cm long, similar to the centrals or paler. Flowers: Subapical, from the centre of the plant, urn-shaped, 2,5-5 cm in diameter, straw coloured, yellow or green yellow with red throat. Scales with dense wool and several bristles. Fruit: Small, almost spherical, dry, green often disintegrating at maturity. 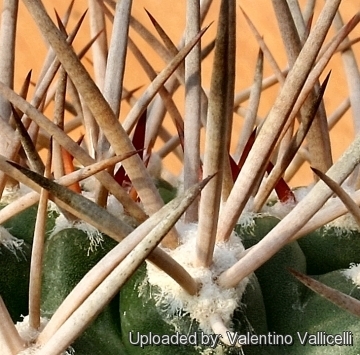 Remarks: Specimens from natural habitats generally have a thicker spination and a thicker epidermal layer. 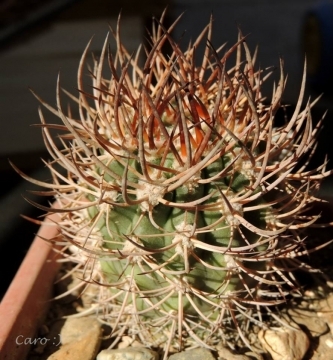 Eriosyce bulbocalyx (Werderm.) Katt. 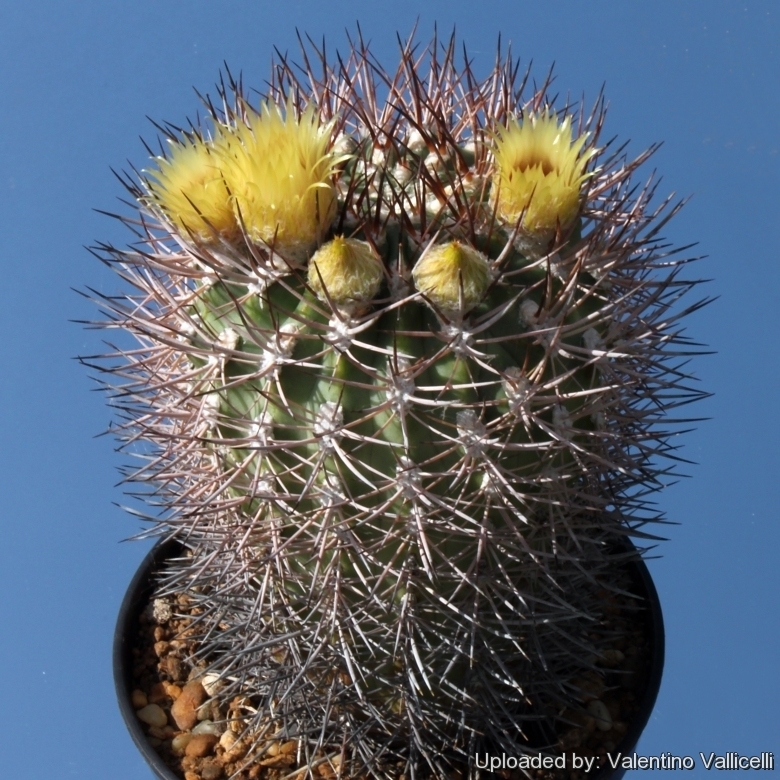 : Usually solitary globular cactus with apex covered with incurved, rust-coloured spines. Eriosyce bulbocalyx var. marayensis (Backeb. ): Marayes, La Rioja, Argentina. 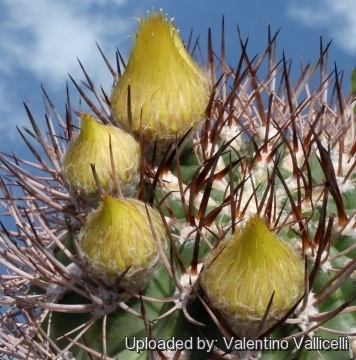 Eriosyce megliolii (Rausch) Ferryman: has thick, incurved, blackish-purple spines. Distribution: Marayes, San Juan, Argentina. 6) Trevisson, M., Perea, M. & Demaio, P. 2013. Eriosyce bulbocalyx. In: IUCN 2013. "IUCN Red List of Threatened Species." Version 2013.2. <www.iucnredlist.org>. Downloaded on 15 February 2014.